We are working professionals that enjoy Civil War history and camping in 18th century conditions. A few take their familys with them and the comradry around the camp fire is contagious. Organized at Garysburg on May 27 1861, Company B joined the 3rd regiment NC Volunteers on November 14, 1861 and was renamed the 13th NC Troops. 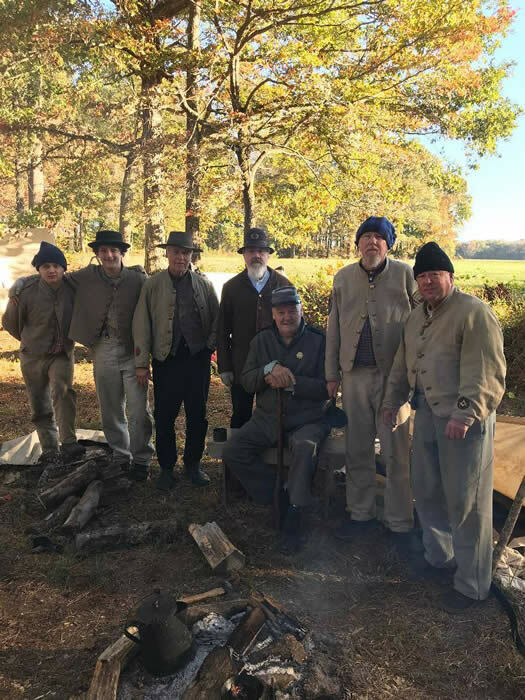 A part of the Living History Association of Mecklenburg, the reenacters of the 13th NC, take their hobby very seriously. From the Confederate Grey Kepi (caps), to the linen suspenders and Enfield Muskets, every article of clothing, blankets and eating utensils are made to be an exact replica of that which was used during the Civil War. Most events are staged from Fridays through Sundays and in some cases, on the actual field where the original battles were fought. During this weekend, each reenacter is completely absorbed in 19th century life. meals are prepared over an open fire the same way they were in 1862, and each night is spent covered in a wool blanket in a tent or under the stars. There are many suppliers or Sutlers, to choose from to obtain the needed items. After the first year, the only costs are annual dues of approximately $25 , and registration for each of the ten yearly events which averages around $5 - $20 per event. Transportation is shared by the close knit members of the unit and meals are usually provided at the major events. The Living History Association of Mecklenburg, Inc., also produces a monthly newsletter, The Ranaleburg Rifleman, which is the official publication of he 13th North Carolina, Company B and the 136th NY reenacters.